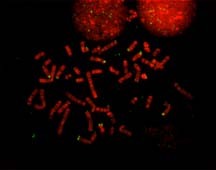 This image shows chromosomes with fluorescent R-bands. The image has been pseudocolored, to look like it does in the microscope. Otherwise, the imaging system turns out black and white chromosomes. The bright green dots are probes complementary to olfactory receptor homologues. In most chromosomes these areas are subtelomeric, i.e. 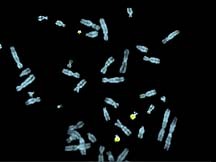 near the end of the chromosomes, but in chromosome 2 (bottom, left) we see that the probe has hybridized to the middle of the chromosome. A comparison with ape chromosomes shows that the human chromosome 2 is the result of an end to end fusion of two ancestral chromosomes. As a result the two subtelomeric ends became the middle of chromosome 2, which is why we get hybridization of the probe there. 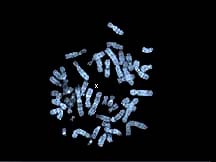 This image shows a probe for the Xist gene, on the X chromosome. 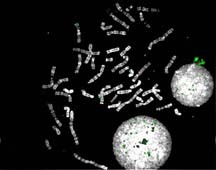 This image shows a paint of chromosome 22. In addition to the two normal copies of 22, there is also a small extra piece, a marker, derived from 22 material.